A rematch against the Running Tebows. They’re not the team X we’ve been told to worry about, but I guess they’re Team Xtian. The good news is the regulations preventing slaughtering horses for human food finally expired. The bad news is no one has taken advantage of this exciting business opportunity yet. Oh well, the Pats play the Broncos and Colts next year, fingers crossed. One of the signature concessions at Mile High is the Broncos Brat. A 1/3rd pound bratwurst with grilled onions, peppers and sauerkraut. Slice the onion into 8 wedges, and separate the layers. Slice the peppers into strips. Coat with olive oil, and grill either in a vegetable basket, or on a sheet of aluminum foil. To a large pot, add the 2 bottles of beer, and the bratwursts. Move the pot to a section of the grill where you have the heat set to low. Allow it to drop to a simmer. Once it is simmering, add the brats. Simmer for 20 minutes. Do not boil as they’ll split. Brats are usually precooked, but even if the ones you have aren’t they will be cooked after this simmering. Take the brats out of the cooking liquid and roast them over the section of the grill with high heat. Allow them to pick up some color and turn when needed. Place a brat on each bun, and if desired top with a few of the onion pieces, peppers and sauerkraut. Whereas a Black IPA is an IPA darkened to look and sometimes taste similar to a Porter or Stout. A white IPA is an IPA with some characteristics taken from the Belgian Wit beer. Such as an Allagash White, or one of the toned down widely available versions favored by Pete King. This means there are wheat and spices used in making the White IPA. In an odd but not sad coincidence the spices in the Belgian Wit were originally used in place of hops. Coriander and citrus peel provided citrusy flavors and aromas that aren’t all that common in European hops, particularly orange, grapefruit and tropical fruit. Therefore, four hundred years ago when the Belgian Wit was first appearing these were new flavors in beer. When the modern American hop growing movement really took off, four hundred years later. Citrus turned out to be one of the signature aromas and flavors of American hops. In some ways these are also a spin off of all the “Belgian IPAs” that came out a few years ago. Those were the first IPAs made with Belgian yeast. The White IPAs will tend to be lower in alcohol, somewhere in the 5 to 7% ABV range. Along the lines of a normal IPA. Belgian IPAs tend stronger, usually at least 8% ABV in keeping with a Belgian Triple or Double IPA. The Belgian IPAs usually didn’t have added spices, relying on the yeast to provide the spice notes. When they do the variety of spices are different from those in an Wit. White IPAs will contain Belgian Wit ale spices – coriander, various citrus peels, grains of paradise, chamomile. Finally the White IPA should contain Wheat, if it doesn’t it won’t be cloudy. Cloudiness being caused by the higher level of protein contained in wheat when compared to barley. The tie in to Denver isn’t an obvious one. Until you consider the Belgian White style only took off in this country when Coors started making Blue Moon. Without that “craft like” beer, then Belgian Whites wouldn’t have become so popular. And it’s unlikely anyone would have thought to combine them with an IPA. Deschutes and Boulevard produced the first two that I’m aware of. There collaboration being a similar recipe brewed at each facility. Boulevard having more experience with wheat and Belgian beers. And Deschutes being one of the best Pacific Northwest brewers = hops. Boulevard has arrived in New England just in 2011, they haven’t sent their Collaboration #2 White IPA yet, but that doesn’t mean it won’t arrive at some point. It was meant to be a one time brew, but if the style takes off I’m sure they wouldn’t let one of the original 2 die off. Deschutes, who we sadly can’t get, already came out with a second limited white IPA called Chainbreaker. 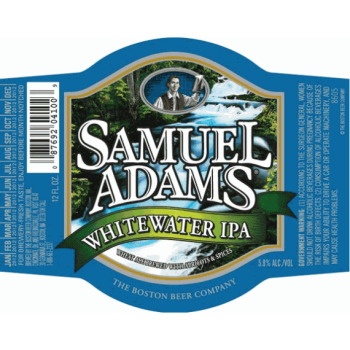 Sam Adams just introduced a new beer into it’s 2012 lineup, Whitewater IPA. The release was set to occur with the Spring mixpack, and on the brewer’s calendar that meant about a week after Winter actually started. With orange peel, coriander and apricot. Shades of Dogfish Head Aprihop. The website does say February 2012, but there are already places selling this in the spring mixpack. It may be the 6 packs and draft that will be arriving in February. Harpoon will be making a White IPA as part of it’s 100 Barrel Series. This one won’t be out until August, however this month the Black IPA 100 Barrel we mentioned would be made is finally coming out. Saranac White IPA is a winter seasonal, so get it now. 6% ABV, Citra hops go well with the orange peel and coriander. All provide citrus flavors and Citra also brings in some tropical fruit. Pete King will lose it over this beer. It’s a draft only beer, and you won’t find it on the website but Blue Point on Long Island has made their Blue Point White IPA a few times since the summer. Normally we’d include many more beers, but there just aren’t any right now. Good news is anyone on the Eastern Seaboard should be able to find Sam, Saranac and eventually Harpoon. And you will be seeing more. Wheat beers and IPAs are two of the top selling styles. Other breweries won’t let the opportunity pass them by. Now when you see more and more of these “White IPA”s appearing you’ll know what to expect. WHO really gives two shits what they eat in Denver?? This page is the the Denver Daily.